The El Niño Southern Oscillation (ENSO) is the world's dominant source of year-to-year climatic variation. The oscillation originates in the Pacific Ocean region, where a natural quasi-periodic variation in atmospheric pressure between east and west Pacific affects the east-west directional flow of low-latitude ocean surface waters, and hence the flow of moist air in the lower atmosphere. Reflecting this process, when the oscillation "index" is low, the sea surface temperatures in the Pacific Ocean rise in the east and fall in the west. This El Niño event has wide-ranging consequences for weather in low-to-mid latitudes around the world. It is especially associated with droughts and floods. During these El Niño events, which occur approximately twice per decade, there is heavy rain on the west coast of South America (especially Peru) and reduced rainfall (often drought) in eastern Australia, parts of Southeast Asia, South Asia, the Horn of Africa, southern Africa, and Venezuela and its environs. During a La Niña, the opposite phase of the cycle, the climate pattern is typically reversed. The ENSO phenomenon is important for the understanding of climatic influences on infectious diseases for two reasons - as recently discussed by Kovats and colleagues (2003). First, it provides a substantial contrast in temperature and rainfall between the two extremes of the cycle - a "natural experiment" that can reveal clearly how climatic variation affects infectious diseases. Second, since climate variability is anticipated to increase with climate change, the ENSO phenomenon may well intensify. Several time series studies have examined ENSO in relation to dengue fever outbreaks in the Asia-Pacific region, where El Niño and La Niña events appear to have influenced the occurrence of dengue fever outbreaks (Hales et al., 1996, 1999; Hopp and Foley, 2003). In South Asia and South America (Venezuela and Columbia), both phases of the ENSO cycle have been associated with malaria outbreaks (Bouma and van der Kaay, 1996; Bouma et al., 1996, 1997; Bouma and Dye, 1997). Similarly, ENSO-related variations in climatic conditions in Australia have influenced outbreaks of Ross River virus disease (Maelzer et al., 1999; Woodruff et al., 2002; Tong et al., 2004). Those studies that incorporate multi-decadal time series data, entailing a long series of El Niño and La Niña events, are best able to reveal an association between ENSO and infectious diseases. Many of the observed associations have a plausible climatic explanation. In particular, the higher temperatures characteristic of El Niño events can affect both the vector species and the pathogen (in ways described in the main text). Tidal inundation is essential for salt-marsh mosquito breeding: sea levels and tide heights rise, and wetland areas are more frequently inundated in years when sea surface temperatures are regionally warmer (such as during a La Niña phase in Australia, or an El Niño phase on the west coast of South America). 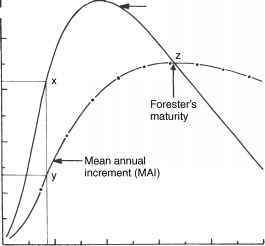 The effect of ENSO cycles on rainfall and subsequent disease is more complex. For example, in poor and highly crowded tropical and sub-tropical regions, heavy rainfall and flooding may result in outbreaks of diarrhea - whereas very high rainfall can also reduce mosquito populations by flushing larvae from their aquatic habitat. 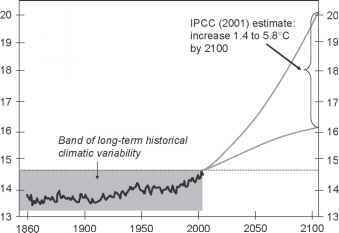 Figure 14.3 Increasing average global temperatures. (especially carbon dioxide and methane from industrial, transport, mining, and agricultural practices) will affect the global climate system. In particular, Earth's surface will warm and precipitation patterns will change. Recent scientific consensus is that this predicted process of climate change is now becoming evident, and that most of the warming that has occurred over the past half-century has been due to human actions (IPCC, 2001; see also Figure 14.3). The approximately 0.5°C warming that has occurred in Earth's average surface temperature since the mid-1970s has evidently carried us above the upper range of the millennium-long statistical band of climatic variability. The UN's Intergovernmental Panel on Climate Change forecasts a rise of between 1.4 and 5.8°C this century, depending on future levels of greenhouse gas emissions, the sensitivity of the climate system to these higher concentrations of atmospheric greenhouse gases (IPCC, 2001), and other processes that could amplify or dampen the rate of change - such as ice-albedo and carbon-cycle feedbacks. At the time of writing, the scientific literature is beginning to point in the direction of more rapid change in climatic conditions, and a greater risk that the upper end of the Intergovernmental Panel's estimate will be reached or exceeded by 2100. If, as predicted by mainstream climate science, Earth should warm by 2-3°C this century, it would be an extraordinarily rapid event that would reverse the global cooling that has occurred over the past 20-30 million years. Many of the natural systems upon which human societies depend would be adversely affected. Further, if the process of climate change becomes non-linear, with critical thresholds being passed - such as the recent positive feedback from the thawing Siberian permafrost and its release of methane - warming could proceed faster than has been foreseen.